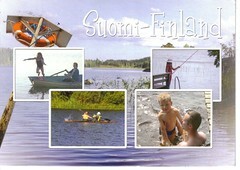 A postcrossing postcard from Timo and Hanna in Finland. Their 2yo son very kindly drew me a picture of a cruise ship on the back of the card. I’ll hang on to this. If he becomes a famous Finish artisit it might be worth a fortune some day!